Trace Santa Fe's development from humble village to cultural center through the artists who settled here. Gustave Baumann (1881-1971) wrote "Art...is a kind of tyrant; it pushes you around. It came to me dressed in wanderlust." In 1918 that wanderlust brought him to Taos, a city he found too crowded and too social. He came down the road to Santa Fe (a long, treacherous journey in those days) where he lived and worked for over 50 years. Santa Fe was the right place for him. He wrote, "While Santa Fe has its quota of artists, it never was a colony in the accepted sense. Its interests are too diversified, which as far as I was concerned was a lucky break." Baumann was typical of the diversified artists in Santa Fe, not only producing his distinctive and colorful woodblock prints, but taking part in the life of the community. He was Works Progress Administration (WPA) coordinator for Santa Fe and carved over 60 puppets for the "Marionette Theater," which can still be seen today. Stacia Lewandowski writes about the disparate community of artists and their contributions to the city in her book From Humble Village to Cultural Center: The Birth and Growth of Santa Fe's Art Community. She began by putting together walking tours of artists' homes in Santa Fe but soon realized that the colorful artists and their participation in the life of the city made a fascinating story. 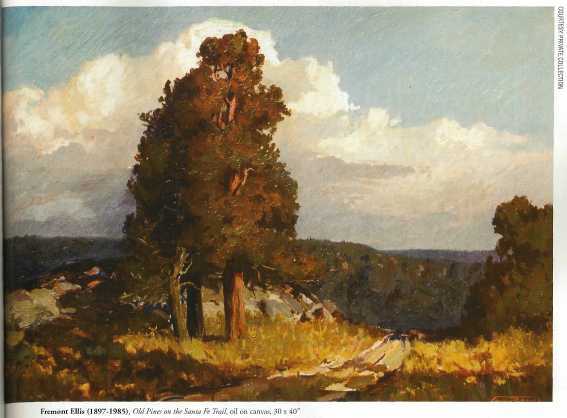 She writes, "Particularly interesting to discover is how the artists responded to the Santa Fe environment once they arrived. Some were enraptured for a lifetime. Others found the city engaging for a limited period, while there were those whose stay was brief because they were not convinced it served their artistic needs. Those who found the environment captivating, however, responded with a visceral enthusiasm that spilled over into the life of the city. These artists became energetic, visible members of the community—activists as well as neighbors—who provided varied expertise, assistance, and highly entertaining diversions. As a result, their influence seeped into the city culture and created an atmosphere attentive to the arts." Today, 100 years after the arrival of the first Anglo-American artists, Santa Fe is one of the top art markets in the country, still manifesting the diversity that Baumann praised. Although artists had passed through the region during the 19th century, Warren E. Rollins (1861-1962) was the first to have an exhibition before 1910, drawn to the region in search of new subject matter. Lewandowski writes, "In Santa Fe Rollins met with the former Territorial Gov. L. Bradford Prince to convince him of the wisdom of his notion. It was reported that Prince responded by saying, 'I can't see what good an art exhibit will do; on the other hand, I can't see that it could possibly do any harm.'" Will Shuster (1893-1969), Indian Dance at Taos Pueblo, oil on wood panel, 9-1/2"x12-3/4"
Other artists came to the region seeking better health. Among them was Carlos Vierra (1876- 1937) who had arrived here in 1904, the first resident Anglo-American artist. Like so many of his contemporaries, Vierra developed an intense interest in preserving the Native American arts and culture of the region. Will Shuster (1893-1969) moved to Santa Fe to recover from tuberculosis. In 1921, he and |ozef Bakos (1891-1977), Willard Nash (1898-1943), Fremont Ellis (1897-1985), and Walter Mruk (1883-1942) formed Los Cinco Pintores who distinguished themselves from the painters in Taos with their "modernist" style. When the group first exhibited, a critic wrote, "These men believe in color and are not afraid to use it. Upon entering the galleries, visitors are greeted with a great shout of color that's almost stimulating." B.J.O. Nordfeldt (1878-1955) came to Santa Fe to visit his friend William Penhallow Henderson (1877-1943) and eventually settled here for 20 years. His work was inspired by Manet, Gaugin, Cezanne and the Fauvists, whose work he saw when he was studying in Paris. Santa Fe Street Scene (1926) bursts with the energy of the scene as he experimented with bright colors and flat patterns. Nordfeldt, too, felt the need to participate in the community and was one of the founders of the Indian Artists Fund, which helped to preserve Pueblo arts. Henderson had first come to the region in the 1880s with his cattle raising parents. He moved to Santa Fe in 1916 with his wife who had tuberculosis. 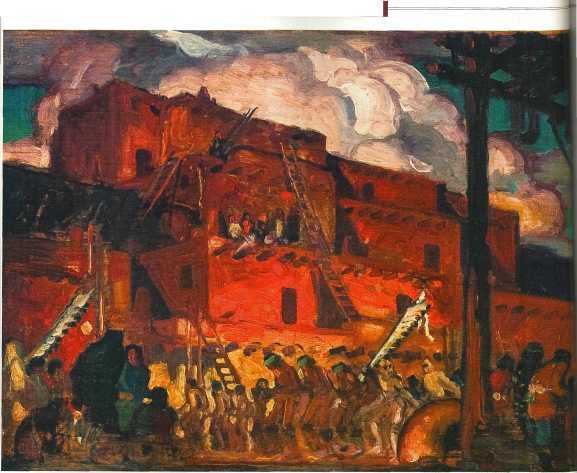 To make ends meet, Henderson designed buildings and furniture in the region and, under the WPA, six murals in the Santa Fe Federal Court building. Fremont Ellis had been an optometrist and a photographer. Perhaps the least "modern" of Los Cinco Pintores, Ellis experimented with color photography to obtain his often unusual color palette. Fremont Ellis (1897-1985), Old Pines on the Santa Fe Trail, oil on canvas, 30"x40"
The vitality of Santa Fe as an art mecca today echoes its early beginnings. "A study of Santa Fe in the early 20th century opens a kind of Pandora's box from which personalities and ideas spring with such vigor that it is easy to envision them still among us," Lewandowski writes. "In many ways they are. Within the early artist community in Santa Fe there were people deeply committed to the city, its environment, and its residents. They were certainly absorbed in their own artistic goals, but they did not sequester themselves from the rest of the population. Rather, many of the artists worked within the community and made profound contributions that enhanced the city itself. They accomplished much that today we take for granted. If it were not for this creative body with talent, passion and foresight, the nature of the city of Santa Fe might be very different today." Santa Fe Editor John O'Hern, who has retired after 30 years in the museum business, specifically as the Executive Director and Curator o f the Arnot Art Museum, Elmira, N. Y., is the originator of the internationally acclaimed Re-presenting Representation exhibitions, which promote realism in its many guises. John was chair o f the Artists Panel of the New York State Council on the Arts. He writes for gallery publications around the world, including regular monthly features on Art Market Insights in American Art Collector magazine. Having succumbed to the lure of the West, he now lives in what he refers to as a "converted adobe goat shed," in the high desert of New Mexico, where he is acquainting himself with new flora and fauna.